Statistics offer a wealth of possibilities and the world of aviation is no exception to the rule. 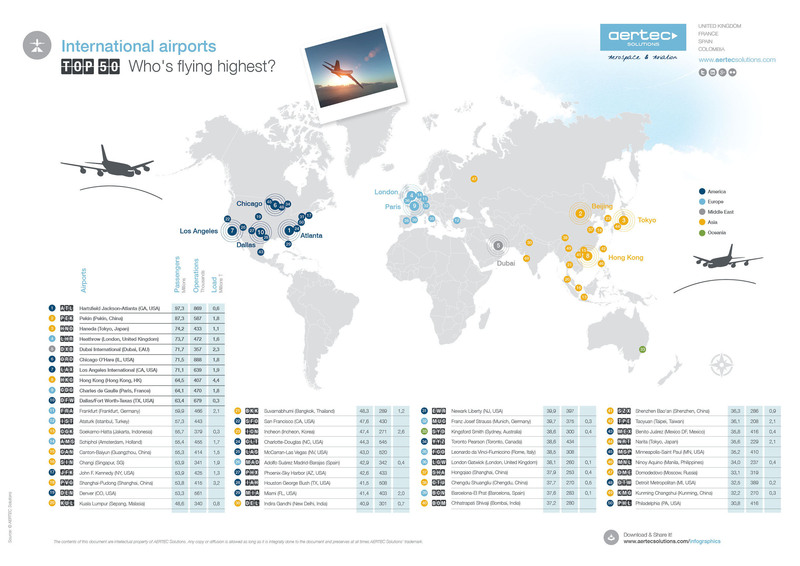 Every so often, rankings are published on the largest airports, the airports having the most traffic, the most beautiful airports, the most desirable airports, the most boring airports, the cleanest airports, the most silent airports, the most sustainable airports, the airports having the best restaurants, the ones with the most attractions, etc. and any other lists you could possibly imagine. The truth of the matter is that airport operators and managers tend to have a quick glance at the rankings – without ever recognising it – to see if their airport appears in any of them. And it is good that they do. Users are becoming increasingly sensitive to the opinions expressed by others. In a highly communicated society like ours, the dissemination of users’ data and opinions is playing an ever increasing role in decision-making. However, we wish to focus on objective data in this infographic, and not on opinions. Which are the world’s 50 largest airports? In order to answer this question, we have taken as a reference the number of passengers per year, the number of operations and cargo area’s volume of airports around the world and we’ve sorted them to identify the largest ones (the annual data refers to April 2015). Download this infographic and enjoy the data. Source: Produced internally, using information published by ACI, Eurostats, TranStats, CAPA, Amadeus, Port Authorities (GA, IL, CA, TX, NY, CO, NC, AZ, FL, NJ, MN, MI, PA) along with annual reports of all the airports mentioned in the infographic. The information corresponds to the period of April 2014 – March 2015.